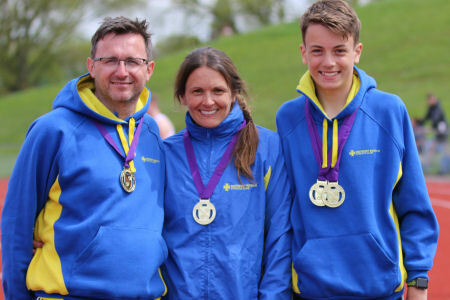 After a busy weekend, the Bank Holiday Monday was a further opportunity for athletes to test themselves and without the wind that had affected the Mid Lancs and YDL fixtures over the weekend. At Trafford, U11s Charlotte Hughes and Hannah Keenan, U13s Amber Hughes, Thomas Kilburn and Jessica Keenan and U15s Sam Coupland, Katie Piercy and Olivia Logan pulled on their blue and yellow vests and slapped on the suncream on what was a very hot day that was to provide 10 PBs and some very good performances. Hannah Keenan, ran a PB in the 150m of 23.46s, ran a 2nd PB in the 600m, a very creditable 2:03.98, and it was 3 PB's jumping 3.28m in the Long Jump. Charlotte Hughes, jumped 3.04m in the Long Jump and set a PB in the 75m of 12.88s, unfortunately injuring her arm in the process so she couldn't complete the 150m,(but she did watch from up a tree she was able to climb!). Amber Hughes had a great day setting 3 PBs whilst dipping below significant targets and earning a meal out of her choice from Barrie. 75m of 9.95s, 150m in 19.90s & 11.16s for the 70mH, winning all 3 events but most importantly clearly this indicates a recovery from her recent injury. Thomas Kilburn improved his best in the Shot with a put of 4.80m, Long Jumped 3.29m and threw the javelin for the first time in competition a good 17.41m. Jessica Keenan ran the 150m in 23.44s, and set new PB's in the Long Jump of 3.71m and 70mH of 12.78s was also good enough to win her heat. Sam Coupland ran the 80mH in 12.93 for 2nd place; another sub 13 second race. A rare 100m completed in 12.86s was a PB and good for 3rd and finally a Long Jump of 5.12m was 2nd on the day. Katie Piercy ran the 75mH in 13.37 and won her heat. She also threw the javelin 25.48m for 2nd place and put the Shot 8.83m to win that competition. Last but not least, and worth staying until the very end for, was Olivia Logan who attended to run the 1,500m and was focussed on attaining the entry standard for English Schools of 4:48. After spending a lot of time in the sunshine Olivia set of a little too quickly but settled into what turned into a race rather than a time trial with Lilly Saxon of Solihull and Small Heath that resulted in a sprint finish and an excellent time of 4:44.44 for the event win. Round 2 of the YDL Upper Age Group was held at the Stanley Park Arena in Blackpool on Sunday. It was a world apart from the constant stream of races at the Mid Lancs on Saturday; a more sedate, drawn out affair, whilst we were treated to a rock concert in the park as background music. Fewer athletes take part at this level, leading to teams bolstered with higher competition athletes from other clubs but I was impressed by the number of sprint athletes taking part. And there was undoubted quality across the events with the inevitable 'just-for-the-points' athletes. The very first event provoked a discussion on the timekeepers' stand about whether points should only be awarded if a standard is met but, to be fair, the rest of the track events were competitive. This was only the 2nd match in this our first year in the UAG league and it was pleasing to finish 2nd again behind (and closer this time to) the M60 Nomads, a Greater Manchester combined team. Match scores were M60 Nomads 637, S'port Waterloo 519, Border 489, B'pool Wyre & Fylde 476, Horwich 260, Bury 247,St Helens 224 and Team North Cumbria 197. The highlight of the day came towards the end when our Under 20 Men took to the track for the 4 x 100m relay. At the first meeting at Bury they set a new Club Record of 47.3. Today the baton passing was slick and they stormed around in 45.3 to take a massive 2 seconds off their old record! Our Female team was, I think, all Under 17 but able to compete in some of the Under 20 events. They were Amy Bloxsome, Lilly-Ann Grayson, Megan Howarth, Ava Leigh, Eve McMahon, Louise Murphy-Worrell, Amy Rex, Bekki Roche, Stephanie Robertson, Olivia Taylor and Freya Walsh. The girls had 6 event wins. Stephanie won the u17 100m in 13.2 , the 80m hurdles in 12.7 and she improved her triple jump PB with a winning jump of 10m 34. Bekki won the hammer with 53m 12 and the U20W shot with a best of 10m 35. And Ava won the U17 shot with 10m 28. And there were plenty of PBs too although, like Saturday, they were mostly in field events. Lilly-Ann ran a her first club 800m of the season, finishing 2nd in a PB 2:24.3. Louise equalled her 200m PB of 31,3 and improved on her previous long jump best with 3m 61. She also ran 100m in 14.6. Megan's 27m 29 in the javelin was a 2 metre improvement in her previous best to take max 'B' points. She also threw the javelin 31m 84. Amy Rex had a PB in both the shot (8m 54) and the discus (18m 65 - another massive 3 metre improvement!) and she threw the U20 javelin 16m 73. And Eve had a PB in the discus of 15m 32 to go with a 24m 78 javelin throw. The girls competed in both relays, 4th in 4 x 100m in 55.4 and 2nd in 4 x 300m in 3:12.3. Our Male team was more distinctly Under 17 and Under 20. The Under 17 Men were Joshua Bankier, Ethan Harrison, Jamie Hopkins, Kieran McGreevy, Patrick Manchester, Drumayne Moore and Luke Suarez. Jamie won all three of his event starting with the 400m hurdles in 66.8, a 1m 70 high jump and 11m 74 in the triple jump. The other event winner was patrick Manchester in the javelin throwing 27m 98. There may have been no other competitors but that is a decent throw! He also threw the discus 18 metres and his 9m 29 shot put was a new PB by half a metre! Ethan recorded a new PB in the shot too, 7m 86, to go with his 56.2 400m run an his 25.5 200m. Drumayne also recorded a new PB, his in the triple jump with 10m 74 to win the 'B' competition. He also ran 13.9 in the non-scoring 100m and 27.0 in the Under 20 200m..
Luke was our fastest under 17 running 11.9 for 100m and 24.5 for 200m. He was also 2nd in the long jump with 5m 67. Joshua Bankier ran 14.0 for 100m and 61.3 for 400m. And finally, Kieran ran 13.2 for 100m. Our Under 20 Men were Ben Apps, Nathan Byrne, Daniel Byrne, Harry Flanagan and Darion Moore. Harry is in fine form looking towards English Schools and ran 11.2 and 22.4 to win both the 100m and 200m races. Ben Apps is in good form too, winning the triple jump with a new PB of 13m 67 and was 2nd in the long jump with 6m 17, another PB!. He also ran a 400m in 56.1 to win the 'B' race. Brothers Nathan and Daniel were stacking up the points in the throws. Nathan was 2nd in the shot with a season's best 11m 05, 2nd in the discus with 34m 09 and he won the 'B' javelin competition with 25m 11. Daniel won the 'A' javelin with 31m 35 and he won the 'B' discus with 16m 52. And Darion ran 12.5 for 2nd 'B' 100m. In their final event, Darion, Ben, Harry joined with Luke to run a splendid 4 x 100m in a new club record time of 45.3. I think even coach Graham would have been proud of the takeovers! Thanks to team manager Lee Coupland and our team of officials: Steve Boreham, Lesley Scott, Emma Howarth, Lee Coupland, Barrie Hughes, Dave Whitehead and Steve James. The combination of sunny weather and a Bank Holiday weekend resulted in the usual traffic congestion on the M6 which caused a number of runners to arrive late with little time to register. However, the organisers were aware of the problem and delayed the start of the race, which this year, saw an increase of 40 runners over the 2017 entry. Following the recent dry spell the course was quite dry and hard, giving good conditions for running. Due to the growth in entries, the course has been extended over the last few years to include a large lap of the grassy meadow to spread the runners out before the first climb which follows a narrow track up the side of the fell to the top of the crags. The route up was sheltered from the breeze so you soon became quite warm before reaching the top and the cooling breeze. The route then took the runners over the top of the crags before descending to a road crossing and through fields before another rocky descent to the track at the bottom of Farelton Knott and then the tough steep climb back up to the top of the Knott. 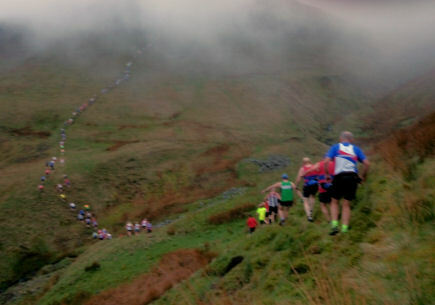 Once at the top the runners faced a stiff head wind running across the top of the crags to a welcome water station at the return road crossing, providing welcome refreshment ahead of the long steady final climb and run across the top of the crags to the long fast grassy descent and final run in to the finish back in the village. Despite being caught in the traffic congestion, Steve Wilkinson had a good run and was first SWAC runner home in 65.43, scoring his first points in this year’s grand prix event, second home was Brian Davey in 69.49 (3rd V60 o/all). Michelle Spencer was first SWAC lady to finish in 81.36, scoring her third grand prix victory, second home was Carole James in 88.08 (3rd LV50 o/all) and third home was Elaine Sutton in 106.13. The warm sunny conditions took a toll on the runners who were glad to partake in the usual delicious selection of tea and cakes to aid their recovery after the race! Round 3 of the Mid Lancs league attracted a select group of Southport Waterloo athletes to Wilson Playing Fields, Hyndburn, on Saturday. A warm, sunny day was spoiled by a strong, gusting easterly wind but the athletics were enjoyable and competitive as usual in this league although you would be disappointed if you were looking for a PB. The windy conditions weren't conducive to fast track times, with almost all the PBs earned in field events. This league is not taken as seriously for team competition as the YDL or Northern Leagues and our females came 5th team of 7 in Mid Lancs Division 1 with 78 points and our males were 6th of 7 with 50.5 points. We would need many more males to compete in this league to avoid the males dropping to Div'n 2 next season. In terms of individual competition, Under 13 girls Sierra Jalloh and Amber Hughes both achieved grade 1 standards, something we have come to expect from both of them but it only happens as a result of the hours put in in training. Our Under 13 Girls were Lauren Byrne, Jenna Christian, Amber Hughes, Sahara Jalloh, Sierra Jalloh and Apphia Keenan. Sierra was the fastest of 33 girls run over 6 heats. To run a grade 1 13.3 was impressive in the conditions. She later won the 200m in 28.1, also a grade 1 standard - but only 2 tenths ahead of a Chorley athlete. Amber won the javelin competition with a PB 25m 80 and she was 2nd of 28 girls competing in the long jump competition with a best jump of 4m 27. Jenna achieved two good PBs, clearing 1m 30 in the high jump and throwing the javelin 16m 02. Lauren also achieved a PB in the javelin with 12m 03, meaning all three of our javelin girls threw personal bests. Lauren also ran 15.4 for 100m and long jumped 3m 41. Sahara achieved a PB too, hers in the long jump with a best of 3m 51. Jessica ran 15.3 for 100m and Apphia 15.4. Apphia also ran her 1st 800m in 3:00.2. Millie Ireland, Alex Murphy-Worrell and Katie Piercy were our Under 15 Girls competing at Hyndburn. All three girls achieved PBs! Katie won the shot competition with 8m 20 and was 3rd in the javelin with a best of 26m 45 - a new PB. Alex ran a PB 14.2 for 100m and a discus throw of 19m 22, for 3rd place, put her straight into the club rankings at number 1. Millie ran 3:02.0 for 800m greatly improving on last year's PB of 3 mins 15, a terrific performance in the windy conditions. She also threw the hammer 15m 05 for another PB. Our Under 15 Boys were Leo Christian, Sam Coupland, and Josh Stammers. Leo is proving a talent in the hammer, winning that competition with a best of 35m 82, a significant new PB. He also ran a 200m in 28.0, another PB and a rare one achieved on the track today. Sam's javelin throw was a very good new PB of 31m 27. He also long jumped 4m 89. And Josh was 3rd in the long jump competition with 5m 14, he ran 12.8 for 100m and 25.8 for 2nd place in the 200m. 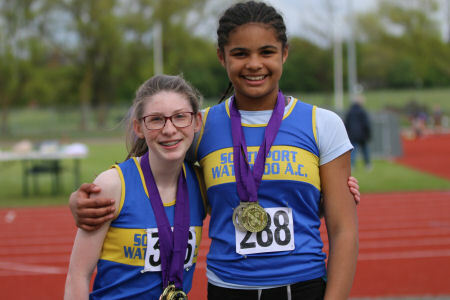 Under 17 Girls Eve McMahon and Louise Murphy-Worrell competed. Eve's shot put of 7m 30 was a massive new PB, improving from 6m 35! her javelin throw of 26m 68 was also a season's best. Louise ran a 100m in 14.9. Senior Woman Katy Coupland competed in discus and hammer. She won the discus competition with a best throw of 28m 26 and threw 17m 01 in the hammer. Our Senior Men were Graham Boreham, Chris Burgess and Lee Coupland. 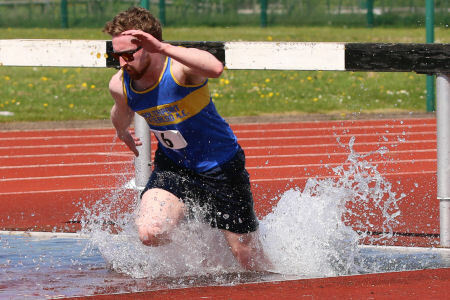 Despite the conditions, Graham managed two season's bests with 54.6 in the 400m, for a 2nd place, and 25.2 in the 200m. Chris ran 12.9 for 100m, 25.7 for 200m and he put the shot 7m 40. Lee threw the hammer 18m 80. Thanks to team manager Lee coupland and our officials Steve Boreham, Field Referee on the day, Steve James, Dave Whitehead, Katy Coupland and Lee Coupland. The 4th round match is at Litherland on Saturday 30th June. The results for the Liverpool Rock 'n Roll 5K, Half Marathon and full Marathon are always difficult to find as there is never a search engine filtering for clubs. Individual runners can find their times but searching for club runners does not appear to be a concern for organisers. Nonetheless, this is a major event in Merseyside and many of our members take part. With thanks to those who have let me know their times, I think club participation was as follows (and our road rankings have been updated on this basis). Times given here are chip times. In the 5 K race, we had two Under 13s running. Sammy Pickerill completed in 19:40, 1st in the Under 18 age group. And Libby Simpson ran 27:10, I'm guessing running with Sarah Pickerill as she completed in the same time. Francois Rafferty finished 8th overall in 17:37. James Brooker ran 22:43, Jodie Rimmer 27:30, Sophie Bennett 27:31, Emma Hopwood 30:38 and Mike Leatherbarrow 31:50. In the Half Marathon, Mike Walker was first home in club colours completing the course in 1:32:39. Richard Houghton ran 1:35:53, Tracey Allan 1:37:06, Jason Oliver 1:39:38, Fleur Culshaw 1:46:18, Jodie Rimmer 1:52:19, Catherine Fearnley 1:53:47, Gina Bellhouse 2:03:31, Rachel Thomas 2:05:39, Sophie Bennett 2:09:48, Jane Blacklin 2:17:23, and Emma Hopwood 2:44:21. Three club runners ran the full marathon. James Brooker ran 3:58:52, Catherine McElhinney 4:55:06 and Caroline King 4:55:07. Have we ever had a more successful team track & field event? On Saturday, at Litherland, we hosted Round 2 of the Youth Development League for Under 13s and Under 15s. Promoted to Div'n 2 for this season, the team were delighted to win the first fixture at Leigh and this home fixture gave us the opportunity to cement our position at the top of the league table. It was close with Team North Cumbria well represented. But in this league we seem to pull away in the later events and in the end we won comfortably by 40 points. 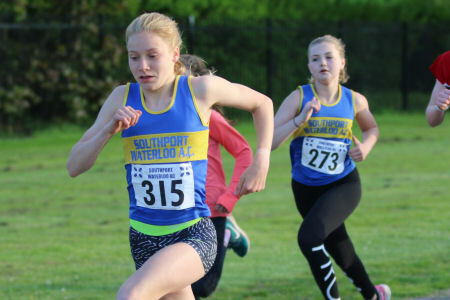 The scores, subject to league scrutiny, were Southport Waterloo 597, Team North Cumbria 557, Wigan Harriers 512, Macclesfield Harriers 467, Bury AC 442.5, Warrington 376, and Leigh Harriers 342. Team North Cumbria traveled well to the first two fixtures and the result of match 3, hosted by Team North Cumbria, will depend on how well our team travels up to Carlisle. But not only did we win the match, our talented young athletes set 6 new club records! They were Sierra Jalloh's 9.9 for 75m, Marcus Burgess' 6m 50 shot put, Sam Coupland's 2m 81 pole vault, and three relays; the Under 13 Girls' 4 x 100m in 53.1, the Under 15 Boys' 4 x 100m in 48.1 and the Under 15 Boys' 4 x 300m in 2:52.2. All very impressive although some relay records were expected to go this year. Litherland basked in glorious sunshine all afternoon; perfect athletics weather but athletes needed to find what shade they could. Our Under 13 Girls were Lauren Byrne, Jenna Christian, Emily Dean, Amber Hughes, Sierra Jalloh, Apphia Keenan, Jessica Keenan, Grace Malone, Rachel Murphy, Libby Simpson and Elizabeth Wake. What a team! The girls had 6 event wins and 5 'B' wins. Sierra's club record 9.9 secs win in the 75m was her first sub 10 secs time and, subject to other performances from the weekend, will rank her 2nd in the UK this year. Sierra also won the 150m in 19.9, another UK top 10 performance. Amber won all three of her events running 11.6 for sprint hurdles (a UK ranked 4 position), putting the shot 10m 14 (currently ranked UK 3 with 10.66) and throwing the javelin a PB 25m 78, all grade 1 performances. Grace won both 'B' sprint events with a PB 10.9 for 75m and 21.5 for 150m. Lauren ran a non-scoring 75m in a PB time of 11.1 and she was 3rd in the high jump with a best clearance of 1m 30. Jenna won the 'B' high jump with 1m 25. Jessica also ran a non-scoring 75m in a season's best time of 11.4 and she improved her hurdles PB to 13.0 finishing 2nd 'B'. Apphia won the 'B' javelin with 15m 59, another PB. Emily's 1200m run in very warm conditions in 4:34.0 was a new PB and Rachel, in the same race, ran a season's best 4:43.. Elizabeth was 3rd over 800m running a PB time of 2:38 and Libby was 3rd 'B' in 2:51. Finally, with such impressive sprinters in the squad we should not be surprised that Jessica, Grace, Amber and Sierra won the 4 x 100m relay. But they ran such a convincing race they set a new club record of 53.1, replacing the existing record of 53.8 set in 1995. 53.1 will be difficult to beat but this team is good enough to go sub-53. Our Under 13 Boys were Monty Barr, Marcus Burgess, Adam Byrne, Jack Clark, Will Collins, Rhys Hulse and Sammy Pickerill. Marcus continued to improve his club record shot with a best of 6m 50 today He also ran a PB 14.5 for 100m and a PB 15.6 for 75m hurdles. Rhys was our only individual event winner in this age group. He won the long jump with a very good 4m 71. He too ran a PB 100m in 13.3 and equalled his previous best clearing 1m 25 in the high jump. Monty ran a PB 2:33.8 in the 800m race and ran 16.3 for the sprint hurdles and 30.5 for 200m. Jack also did an 800 and a 200, running 2:45 and 27.6, and he was 2nd in the javelin with just over 20 metres. Sammy and Will covered the 1500m with Sammy running 5:11 and Will 5:37. Will's long jump of 3m 31 was a PB. And Adam equalled his previous best in the high jump clearing 1m 20. His shot put of 5m 48 was also a PB and he threw the javelin 15m 88. Marcus, Monty, Rhys and Jack won the 4 x 100m relay in 56.1. Our Under 15 Girls were Alice Bird, Millie Ireland, Lucy Milling, Annabel Lockie, Olivia Logan, Katie Piercy, Chloe Sutton and, joining the squad for their first meeting, Eleanor James and Hannah Williams who helped shore up our sprint and middle distance events. Olivia was our only Under 15 Girl event winner, running an impressive 1500m in 4:48.5 in warm conditions and running well clear of the others. Olivia also ran a 200m in 28.8. Hannah ran 14.8 for her first 100m race and 15.9 for the 75m sprint hurdles. She also long jumped 3m 42. Chloe's 100m time of 15.9 was a PB, as was her 3m 06 long jump. Alice had a season's best in the javelin throwing 17m 46 to go with her season's best 2:47 in the 800m and 32.9 for 200m. Eleanor also ran an 800m and 2:35.3 for her first club race was a promising start. She also ran 50.5 for 300m. Holly's 50.1 for 300m was a new PB. Lucy cleared 1m 15 in the high jump and 5:44 in the 1500. Katie had a 2nd, 3rd and 4th finish. She was 2nd in the shot with 8m 42, 3rd in the javelin with a best of 25m 22 and 3rd in the sprint hurdles running a PB 13.2. Annabel and Millie focused on the throws. Millie put the shot 3m 40, threw the discus a PB 9m 48 and threw the hammer 14m 61. Annabel threw the discus 8m 55 and she took maximum 'B' points in the hammer with 9m 50. Finally, our Under 15 Boys were Sam Coupland, Leo Christian, Joseph Kane, Tom Murphy, James Pike, Jonathon Pilkington, Joshua Stammers, Ethan Stanworth and Joseph Sutton. There were several event wins by our Under 15 Boys. Sam won the pole vault with 2m 81. That meant a new club record to replace the 2m 80 he previously shared with Ben Sears. Sam's 1m 60 was another event win and his 4m 93 won the 'B' long jump. Leo won the hammer with 27m 69. He was also 2nd in the shot with 7m 81 and his 2:20.4 for 800m was a new PB. Joseph Kane won both the short sprints; the 100m in 11.8 and the 200m in a PB and Grade 1 time of 23.7.That's an English Schools' qualifying time and his 100m time is just a tenth of a second outside. Ethan ran his first sprint race for the club - 12.3 for 100m, again a good first competition. Josh won the 'B' 200 in a PB 24.8 and another PB in the 300m, finishing 2nd in 39.9. Josh was also 2nd in the long jump with a best of 5m 08. Tom won the 80m hurdles in a PB 13.2 and his 42.5 for 300m was another PB. Jonathon also achieved a PB in the hurdles, winning the 'B' competition in 16.9. He also equalled his high jump PB with 1m 15 and he set a new PB in the discus of 12m 22. James was our only 1500m runner, in a season's best 5:49. He also competed in hammer and javelin. 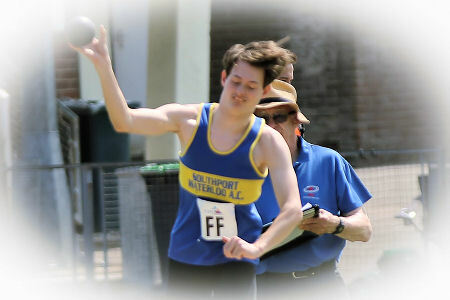 And Joe Sutton competed in both discus (12m 53) and javelin (13m 61). Finally, our Under 15 Boys competed in both relays - winning both in new club record times. Tom, Ethan Josh and Joseph Kane ran 48.1 for the 4 x 100m, just inside the previous 48.1 record. More to come he I think! Then Jonathon, Joseph Kane, Leo and Sam ran the 4 x 300m finishing 2nd in 2:52.2. And that's enough to beat the previous record of 2:53.4. Thanks to Team Manager Graham Boreham and his athletes for an outstanding result. Thanks also to Graham for the photos used here. Thanks, too, to our team of officials - Track: Steve James, Timekeeping: Dave Whitehead (Chief Timekeeper), Lynn Vickers, Field: Lesley Scott (Field Referee), Christopher Henders, Steve Boreham (Clerk of Course), Lee Coupland, Katy Coupland, Dan Stammers, Liam and Lewis on Results. Thanks too to all our helpers in the refreshments tent and other moving hurdles etc. And a final word about the relay successes. Yes, fast sprinters are essential but the work of sprints coach Graham Pilkington is also evident in the clean take overs, an essential learned skill. There were 333 runners in the annual 1 Mile Races for Schools in Victoria Park, Southport, last year. This year, there appears to have been a clash with some primary SATS and this contributed to numbers dropping to 264. The better news was that we seemed to have more Secondary School runners with Birkdale High joining local schools Stanley, Greenbank and Formby and one or two from further afield: Ormskirk, Holy Family, Burscough and Tarleton. But, disappointingly, many high schools still show little interest. The highlight of the evening was Olivia Logan's run in the Year 8/9 Girls' race which she won in a course record time of 5:19. To put that in perspective, it is the fastest time run by a Year 8/9 girl in Victoria Park since the event started back in 1989. And you have to go back to 2007 to find the last time a course record was broken in recent years. Farnborough Rd won the overall Primary Schools' trophy. Norwood was 2nd and Our Lady of Lourdes 3rd. The Senior Schools' trophy was won (again) by Formby High with 4 team wins from the six high school races. Stanley were 2nd and Birkdale 3rd. The meeting started with the Year 5 Girls' race with 54 runners completing the circuit of Victoria Park. The race was won by Tiana Chambers, Farnborough Rd, in 6:21 with Katy Nicholson, Trinity St Peters, 2nd in 6:30 and Lottie Hughes, Forefield, 3rd in 6:50. Farnborough Rd won the team event with Pinfold 2nd and Norwood 3rd. The Year 5 Boys' race always produces the biggest field and, even with just 65 finishers this year, they came through the finish funnel thick and fast, challenging for position. Southport Waterloo runner Luke Ward was the winner in 5:46 with John Paul Cavanagh, St George's, 2nd in 5:55 and Dexter Lewis, Norwood Primary, 3rd in 6:05. With five runners in the top 20, Woodlands Primary took the team award ahead of Farnborough Rd and Great Crosby. 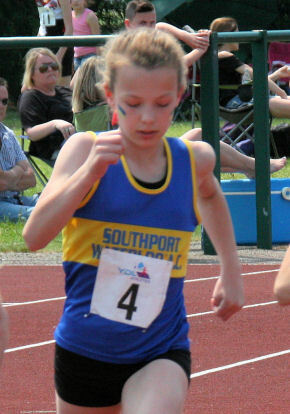 Just 36 girls competed in the Year 6 Girls' race where Southport Waterloo's Emily Dean, running for St Philip's, won in 6:14. 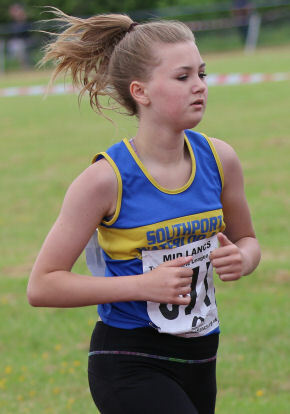 2nd today was Issy Conway, St Luke's Formby, in 6:29 and 3rd was Frankie Lewis, Norwood, in 6:34. Emily was last year's Year 5 winner in 6:33 and, in fact, last year's Year 5 1st, 2nd and 3rd were 1st, 2nd and 3rd in this year's Year 6 race. St Luke's Formby had three finishers in the top 10 and won the team competition ahead of St Jerome's and Norwood. 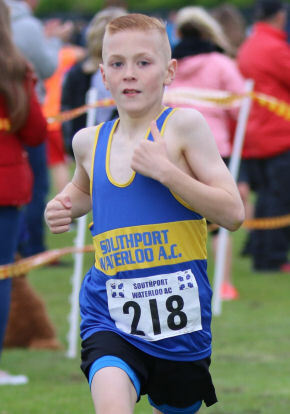 37 boys took part in the Year 6 Boys' race won by Southport Waterloo's Sammy Pickerill, running for Our Lady of Lourdes, in 5:29, 10 seconds faster than last year when he won the Year 5 race. Will O'Donnell, also Southport Waterloo and also running for Our Lady of Lourdes, was 2nd in 5:42. Will was 3rd Year 5 Boy last year. And 3rd this year was Nathan Naylor from St Luke's Formby. Our Lady of Lourdes took the team award from Norwood in 2nd and St Jerome's 3rd. 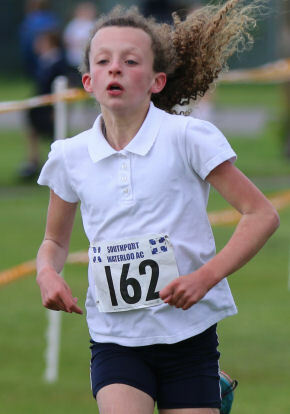 The Year 7 Girls' race had 10 runners, led home by Chloe Bousfield running for Ormskirk High. She crossed the line in 6:02, ahead of Southport Waterloo runner Libby Simpson, Meols Cop, in 8:18 and Alicia Woods, Burscough Priory, in 6:23. Libby and Alicia were 2nd and 3rd Year 6 finishers last year, in 6:18 and 6:20. Only Formby managed a team finish. .
21 Boys competed in the Year 7 Boys' race won by Tyler Halliday-Hawkes, Birkdale High, in 5:50. James Read, Tarleton, and Harry Cocoran, Stanley High, tousled for 2nd place, James just getting to the line first. Both were given the same time of 5:53. 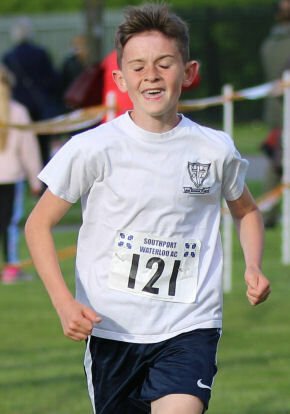 James was also 2nd Year 5 Boy last year but his time was better by 7 seconds this year. Formby won the team competition, Birkdale were 2nd and Stanley were 3rd. The Year 8/9 Girls' race was where we watched Olivia Logan, Greenbank High, set off and maintain a determined pace, passing one of the lead bikes at one stage, to clinch a course record in 5:19. That finish was nearly a minute faster than the 2nd placed runner, Faye Hannaway, Formby High, 3rd last year, finishing in 6:08 with another Formby runner, Emily Williamson, 3rd Year 7 Girl last year, 3rd in 6:09. Formby again won the team event with Stanley 2nd. Jake Dickinson from Bishop Rawthorne won the Year 8/9 Boys' race in a very fast 5:00. Two Formby runners were 2nd and 3rd, Harry Wright in 5:20 and Michael Henderson in 5:21. Formby High were 1st team with Birkdale High 2nd..
Three Year 10/11 Girls ran with the Year 10/11 Boys' . Last year's Year 8/9 winner Jennifer Williamson, Formby, was the Girls' winner in 5:46, with Phoebe Lucas, Formby, 2nd in 6:19 and Ava Dacre, Stanley, 3rd in 7:55. The Boys' race was won by Thomas Corcoran, Stanley, in 5:14, ahead of Harry Steele, Holy Family, last year's Year 8/9 winner, in 5:29, and Matthew Brown of Birkdale so close he was given the same time of 5:29. Stanley won the only team event, the Year 10/11 Boys. Thanks to Race Director Gill Gillison and her team for today's well organised event. This year's championships attracted good numbers, 374 athletes covering 719 event entries! 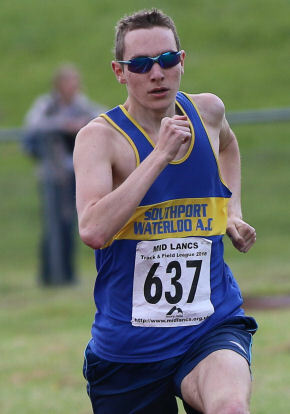 Southport Waterloo had 50 athletes entered, the 3rd largest entry behind Liverpool Harriers and Wirral AC. There were numerous highlights from these championships with several athletes picking up multiple medals. There were 25 event wins, 50 medals won and 39 PBs. Sierra Jalloh set a fantastic new under 13 girls' 150m club record of 19.84. Sam Coupland equalled the current Under 15 Boys' pole vault club record of 2m 80. And, whilst, a full check hasn't been done yet, it looks like Sierra Jalloh, Amber Hughes and Sam Coupland have set Championship Best Performances. In the Under 11 Girls' age group Felicity Fletcher, Charlotte Hughes, and Hannah Keenan competed. This was Felicity's first competition in club colours and she ran 25.68 for 150m and 3:58 for 1000m. Charlotte was 2nd in the soft javelin with 9m 06 and her 25.12 for 150m was a PB. Hannah also achieved a PB, of 2:02.64 in the 600m. Both our Under 11 Boys were also first time competitors. Luke Ward won the 150m in 22.52 and was 4th in 1:51 for 600m. These are good times! Charles Fletcher was 4th over 75m in 12.3 and ran the 1000m in 3:44. Our Under 13 Girls were Lauren Byrne, Jemima Fletcher, Amber Hughes, Sahara Jalloh, Sierra Jalloh, Evie James, Apphia Keenan, Jessica Keenan, Grace Malone, Rachel Murphy, Libby Simpson and Elizabeth Wake. The scale of Sierra's progress is remarkable, improving her 75m PB from 10.22 to 10.01 to win the 75m race, improving her 150m PB from 20.28 at Wigan in April to 19.99 in the heat today then 19.84, a CBP, in the final. Sierra also took silver in the shot for a full bag of medals. Amber won the shot with 9m 23, won the javelin with a PB 24m 96 - a CBP - and won the 70m hurdles in a season's best time of 11.40 making it three gold medals for the day. 11.40 is also a new CBP by nearly half a second. Lauren Byrne was 2nd in the high jump clearing 1m 25, 3rd in the shot with 6m 61 and 3rd in the hurdles in a PB12.62. These were all the medallists but there were plenty more PBs; by Grace in the 150m in 20.98, Rachel with a 2:54 800m run and Emily in the 1200m running 4:34.40. Evie James and Jemima Fletcher competed in club colours for the first time today so a great start to their athletics career. Finally, for the Under 13 Girls, it is a measure of how far we have progressed as a club in Field events that our girls took all three medals in the shot! Our Under 13 Boys were Monty Barr, Adam Byrne, Jack Clark, Will Collins, Will O'Donnell and Sammy Pickerill. We had three event winners here. Jack won the javelin with a PB throw of 24m 76. He was also 2nd in both sprints running 13.52 and 27.54, the latter a new PB. Adam won the high jump with a PB 1m 20, he was also 3rd in the javelin with 16m 66 and his 74m hurdles in in 15.68 was a new PB. And Sammy Pickerill won the 800m race in 2:28.42, a new PB time. His best long jump on the day of 3m 86 was another PB. Will O'Donnell's 28.73 for 4th place in the 200m was a PB for him. Our Under 15 Girls were Katie Piercy and Niamh Procter. Katie took home two gold medals with wins in the shot (8m 75) and the javelin (a PB 25m78). Niamh ran a PB 14.83 in the 75m hurdles as well as competing in long and high jump. Our Under 15 Boys were Leo Christian, Sam Coupland, Joseph Kane, Tom Murphy and Joshua Stammers. The boys here took 10 medals from 11 performances! Leo competed in hammer and took the silver with 27m 06. Sam took three medals with a win in both the pole vault, where he equalled Ben Sears' club record of 2m 80 set back in 2002, and the 80m hurdles which he won in 12.98. the 2m 80 pole vault is also a CBP. Tom ran 13.07 for 100m and 13.48 for the hurdles, both new PBs. Joshua ran a PB 12.21 for 100m to take the silver medal, a PB 24.86 for 200m and he long jumped 5m 27 to win that competition. Perhaps the most remarkable performances were by one of our new young athletes, Joseph Kane. 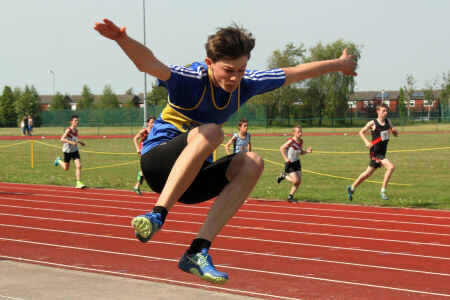 Having become involved in athletics with the club only recently, he is making significant progress. He took the silver medal over 100m at Wavertree, in a Grade 1 PB time of 11.64, and took the bronze in the 200m in a Grade 2 PB time of 24.24. He is an exciting prospect! There were more fine wins by our Under 17 Women; Amy Bloxsome, Lilly-Ann Grayson, Megan Howarth, Eve McMahon, Stephanie Robertson and Freya Walsh. Megan took two medals, winning the javelin competition with 30m 29 coming 2nd in the hammer with a PB best throw of 25m 59. Eve took a silver in the javelin with 24m 08 and a third place medal in the shot with a best of 6m 90. Stephanie had a great day. She won the 80m hurdles in a PB 12.05, That compares with a previous best of 12.3; a massive improvement. She could only finish 3rd in the 100m but again the improvement is excellent, running 12.80 at Wavertree with a previous best of 13.0!. She completed her set of medals with a win in the triple jump with a best jump of 10m 13. 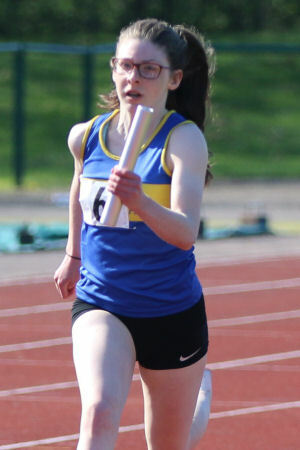 Amy was another sprinter who achieved PBs in both 100m and 200m running 14.36 and 30.38. In middle distance Lilly-Ann took the gold medal over 1500m in 5:18 and Freya moved up to 3000m for the first time and took the gold medal in her age group with a run in 12:01. Our Under 17 Men were Ethan Harrison, Drumayne Moore, Joseph Stuart and Luke Suarez. Drumayne long jumped a PB 4m 83 and .won the triple jump with another PB of 10m 18. Luke took two medals, a 2nd place in the long jump clearing 5m 73 and a 3rd place in the 100m in 11.70, a good new PB. Both Ethan's performances were new PBs. He took silver in the 400m running 54.33 and he ran 12.02 for 100m. And Joseph ran a PB 23.35 to take silver in the 200m. 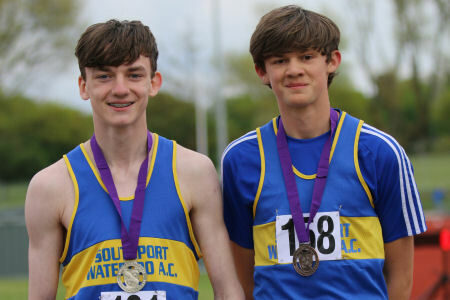 Ben Apps, Harry Flanagan and Darion Moore were our Junior Men at Wavertree. Ben won his triple jump with 13m 04. In fact, it was a triple win in the triple jump with Drumayne Moore and Lee Coupland also winning their triple jump events. Darion took a bronze in the 400m running 59.85 and he equalled his previous best with a 100m run in 12.30 for 4th place. Harry won both his sprint races, the 100m in a Grade 2 time of 10.99 and the 200m in another Grade 2 time and season's best of 22.15. Katy Coupland was our only Senior Woman at these championships. She took the gold medal for a discus win with 26m 92 and the silver for a 7m 33 shot put. And finally, Senior Men Lee Coupland and Liam Harris competed, Lee winning the triple jump with 9m 11 and Liam achieving a Hammer PB to win that event with 40m 50. It was a damp evening for this year’s race, with the top of Pendle Hill covered in cloud, a stark contrast to the beautiful sunny evening of last year. 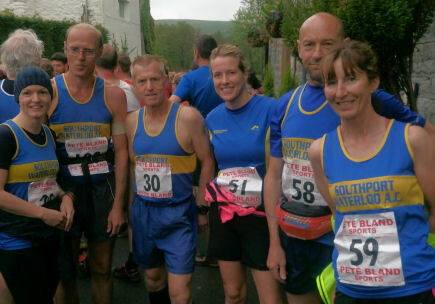 However, six SWAC runners made the journey to the picturesque village of Worston, to join the field of 237 runners for the start of this popular short fell race. The race starts outside the Calf’s Head pub with a short road section before turning into the fields for a steady run out to Little Mearley Wood where the track starts a steady climb through the wood out onto the open fell before crossing a stream to take on the famous “Big Dipper”, which is a steep climb up to Scout cairn before turning to start the sharp descent back down to the fell gate and then following the same route back through the wood and over the fields to the finish. Brian Davey was first home for the club in 44.05 followed by Ed Sherstone in 45.58 and Clive James in 47.55. Michelle Spencer was again first lady home in 49.33 followed by Carole James in 54.17, third home and in her first Grand Prix fell race was Mari Dyson in 58.22. Despite the wet and heavier conditions Clive, Michelle and Carole all improved on their times from last year by over a minute, well done to you all. The next Grand Prix race is the popular Hutton Roof race on Saturday 26th May. The usual great selection of delicious cakes will be on offer at the finish! Lancaster & Morecambe AC held their first open T&F meeting in many years at the Salt Ayre track on bank holiday Monday. Trafford also held an open meeting on Monday and this often attracts a number of Southport Waterloo youngsters but this year our travelling athletes chose to go to Lancaster and support their meeting. On a glorious summer's day - the warmest early May bank holiday on record - 12 athletes competed in Lancaster and left with many medals; 20 in all. There were many fine performances including 7 PBs but the Under 13 Girls' 200m race was special with Sierra Jalloh equalling the club record of 26.9, set by Sally Waring 10 years ago, and Amber Hughes coming home 2nd in a grade 1 time of 27.3 despite having pulled a muscle coming around the top bend. It is thought Amber suffered a sprain so hopefully will be back to full fitness fairly quickly. Katy Coupland was the only Southport Waterloo senior at Lancaster. She won the discus with 29m 55; her best this season. Under 15 Katie Piercy won the shot with 8m 65. Under 15 Sam Coupland won the high jump with a 1m 70 clearance, won the long jump with a good new PB clearance of 5m 56 and was 2nd in the 80m hurdles with 12.9, another PB. 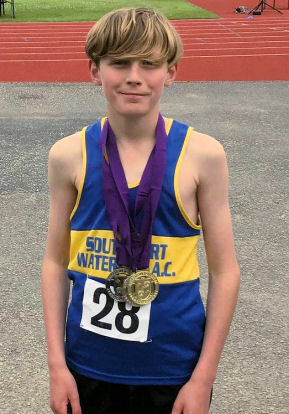 Under 13 Sammy Pickerill won a good 800m race in 2:34.3, a new PB. 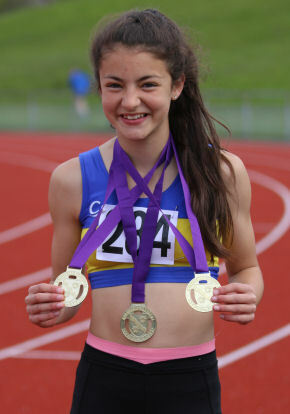 Under 13 Amber Hughes won her 70m hurdles race in 12.4 and was 2nd in the 200m in 27.3 before retiring injured. Under 13 Sierra Jalloh won the 200m in a club record equalling 26.9, won her shot with 6m 43 and won the 100m race in 13.2. That's just a tenth of a second off Amber's current club record! 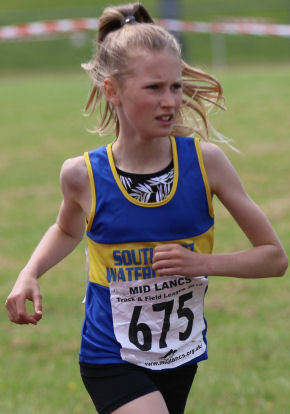 You can't help but feel these Under 13 Girl sprint records are set to fall further this year! Under 13 Jessica Keenan's long jump of 3m 68 was a PB and she took medals in both the 70m hurdles - a bronze - with 14.1 and the 100m, 2nd behind Sierra in 15.0. Sahara Jalloh was the final Under 13 girl. She was another who achieved a long jump PB; 3m 33. Under 11 Charlotte Hughes long jumped 2m 84, ran 13.6 for 80m and took the bronze medal in the 600m race, finishing in 2:14.8. Under 11 Renee Adams won the 80m sprint, in 12.0. Under 9 Erin Griffin took home three medals from her three events. She won the 600m in 2:10.3, won the 80m in 13.3 and was 2nd in the long jump with a best jump of 2m 83. Apologies for any performances missed. The Liverpool Spring 10K, organised by Mersey Races was held on Sunday, on a route running from the Metropolitan Cathedral and finishing in Sefton Park. Nearly 4000 runners of all abilities completed the course. Southport Waterloo's Amanda Crook won the women's race in 35:59 and was the first home of 22 of our club runners. Mike Walker was first man back in 41:30, then James Brooker completed the course in 44:56. Other runners were Paul Aspinall (46:10), Matthew Nelson (47:08), Fleur Culshaw, our 2nd woman (47:13), Stephen Flanagan (47:53), Rachel Flynn (48:58), Donald Wilkinson (51:21), Gina Bellhouse (52:05), Amanda Bradbury (52:53), Suzanne Lally (54:33), Dennis Fenna (5627), Sarah Pickerill 57:47), Jane Blacklin (58:36), Dean Irving (58:55), Joanne McDougall (59:09), Catherine McElhinney (62:18), Joanne Fenna (72:12), Debra Vis (77:44) and Emma Hopwood (77:50). This was the 2nd race in the Merseyside Grand Prix of road races. Our Women's team of 4 were 5th in the event and our Men's team finished 10th. The first Northern League match of the season was a home fixture for the club and Litherland welcomed our guests with glorious, warm sunshine and facilities looking their best after Steve Boreham and Lee Coupland spent Friday prepping them. This league has a reputation for low key, friendly competition and that was in evidence on Saturday. But we all want to win and it was disappointing that, when the first scores were announced early in the afternoon, Southport Waterloo were lying 4th of the 6 teams. By mid afternoon we had passed Burnley to move into 3rd place and, still 3rd after 28 events had been scored, the margin decreased to just 6 points separating 1st and 3rd. After a great showing in the relays, we moved up to 2nd place, 4 points behind Kendal, and the final score would depend on the last event, the Women's javelin competition. Megan Howarth came thru' to win that competition with Eve McMahon taking 2nd 'B' points. It was enough for a match win by 3 points. Final scores, subject to scrutiny, were Pendle 214, Border 237, Burnley 267, Seaton 323.5, Kendal 333 and Southport 336. It is advantageous to have a home fixture and we would hope to win it; but this was not our strongest team and team manager Lee Coupland will be working to fill some of the gaps in the teamsheet for the next match, particularly in the middle distance events. Overall, its hard to pick out a single stand-out athlete but several are worth special mention. An unwell Jimmy Alderson was nonetheless determined to compete for the team and did that remarkably well. Milly Smith is just such an enthusiastic competitor and a joy to watch. Harry Flanagan was dominant in the sprints. Ethan Harrison gave everything in the last leg of the 4 x 400m relay. Liam Harris and Nathan Byrne excelled in the men's throws. 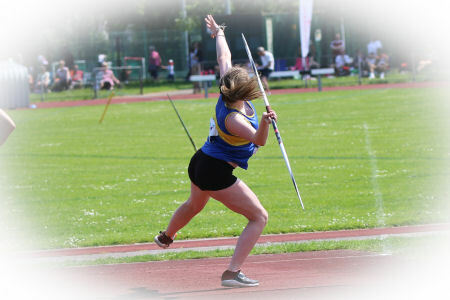 Megan Howarth produced under pressure in the javelin. And everyone worked so well together to support the team. Our Women's team comprised Under 17s Amy Bloxsome, Megan Howarth, Eve McMahon, Stephanie Robertson and Freya Walsh; and Seniors Katy Coupland, Joanne McDougall, Sarah Pickerill and Milly Smith. The women's match was won by 10 points from Kendal with our Under 17s adding excellent quality with event wins by Stephanie in the 100m in a new PB time of 13.0, and her4 x 100m relay; Megan, with a 29m 66 javelin throw; and Freya bringing home the 4 x 400m relay team to win in 5:31.2, in our fastest lap time of 71.9. 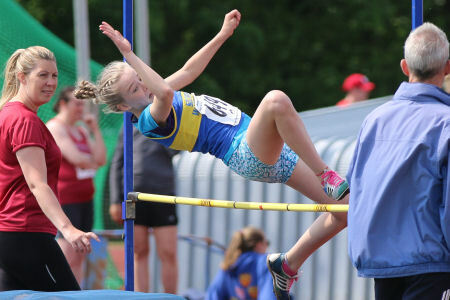 For the seniors, we have come to expect Katy Coupland to multi-event but Milly Smith is enjoying her athletics and she matched Katy with 6 events apiece. Katy competed in her favoured discus, 2nd with 25m 28, hammer, shot, long jump, 400m hurdles and even an 800m, despite a hip injury. Milly won the 'B' 400m hurdles, and ran a flat 400m. She did high jump, long jump and both relays. Joanne ran both sprints in 15.2 and 32.9 and was part of both winning relay teams. 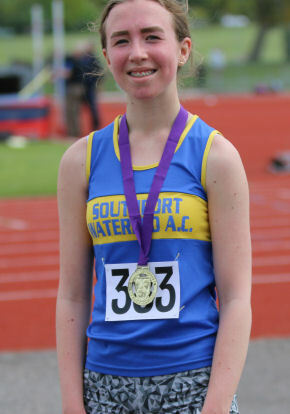 Sarah also ran a 100m, in 17.1, her 400m time was a PB and she threw the discus 13 metres. 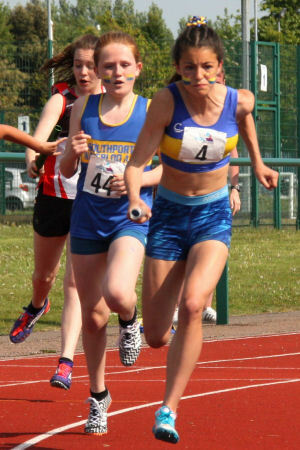 Sprinter Amy ran 100m in 14.8, 200m in 31.2, equalling her PB, and ran in the 4 x 100m relay. Freya ran 5:43.5 for 1500m in very warm conditions, and Megan and Eve contributed great points in the throws. Megan won the javelin with 29m 66 and was 3rd in the 4kg hammer. Eve threw a PB in the 4kg shot - 6m 35 - and was 2nd 'B' in the javelin with a best of 25m 84. The Men's match was much closer with Burnley 93, Seaton 96, Kendal 98 and Southport Waterloo 107. The men had 5 event wins. Liam Harris won the hammer with 40m 30, a great start to his season, just 9 cms off his PB and the club club record of 41m 64 within touching distance. (Easy for me to say!) Liam also put the shot 10m 15 and threw the discus 27m 31. Nathan impressed in the discus with a best of 38m 30, improving his PB by over 5 metres to win the event! Nathan also won the 'B' shot with 9m 89 and threw the javelin 25m 88. Harry won both sprints, running 11.2 and 22.2, the latter a season's best. 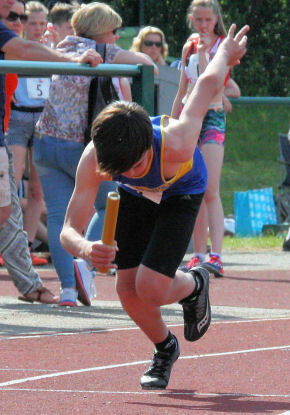 Harry also anchored the winning 4 x 100m relay team in a very good time of 45.6 with some slick baton changes. Jack, Ethan and Darion were our other sprinters. Coincidentally, all ran 12.3 for 100m, a PB by 6 tenths for Darion! Jack ran 25.1 for 200m. Ethan also ran 56.7 for 400m. Darion went on to long jump 4m 48. Graham was 2nd 'A' over 400m in 55.9 and he led for much of the 800m race, finishing in 2:09.9. Jimmy showed his competitive and team spirit. Although clearly unwell early on, within a couple of minutes he was on the start line for the 400m hurdles, finishing 2nd in 71.0. He went on to win the 'B' 800m in 2:14.3, triple jumped 10m 57 for 3rd and ran his first ever (as far as I know) 1500m to fill a space in the teamsheet. He finished his day with the 2nd leg of the 4 x 400m relay. In the distance events, David Hamilton ran the 5000m for a 2nd place in 17:34 and David Gough took the cooler option, the 3K steeplechase, again 2nd, in 12:40. Surprisingly, David Gough's 4m 30 in the long jump was a PB and he triple jumped 8m 35. Team manager Lee supported in the hammer with a best throw of 20m 78. Finally, the men won a good 4 x 100m relay, bolstered by Luke Suarez, but the 4 x 400m was an exciting affair. Graham and Jimmy gave the team a good lead that Darion held on to, handing over to Ethan who ran a superb final lap leading for much of it before Burnley passed on the last 100m to win by 3 tenths of a second. Ethan's magnificent effort produced our fastest leg of 53.8 secs. This was a great result for the whole team. Thanks to all the clubs and athletes for such an enjoyable day of athletics. And thanks to team manager Lee Coupland, our team of officials and helpers; Steve, Chris, Lesley, Barrie, Lee, Emma and Ann on Field; Graham as marksman; Steve J on Track; Dave as timekeeper; Lewis and Liam on results; Jonathan as runner; Sheila and Sue on refreshments.And Barrie and others assisting where needed. Copyright © Southport Waterloo Athletic Club 2018. All rights reserved. 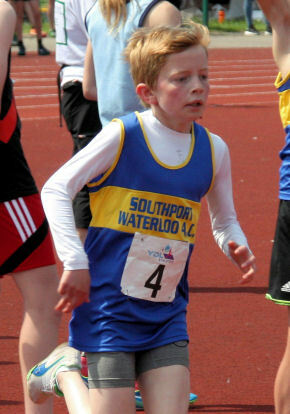 Southport Waterloo AC is affiliated to England Athletics and UKA.